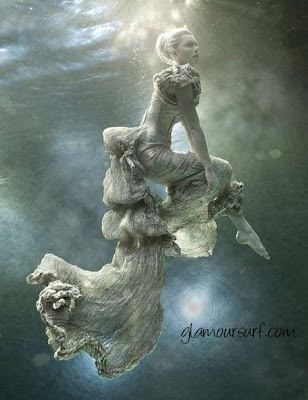 Today at Glamoursplash we look at the underwater fashion photography of Zena Holloway. Zena was born in Bahrain in 1973 and raised in London. In her late teens she traveled extensively as a scuba diver instructor and there developed her interest and passion for photography. 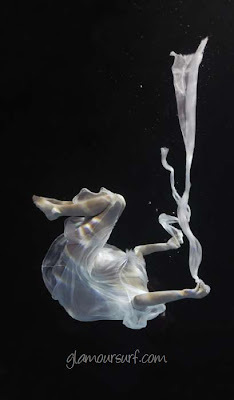 Her images are striking, instinctive and driven by a deep understanding of her medium. 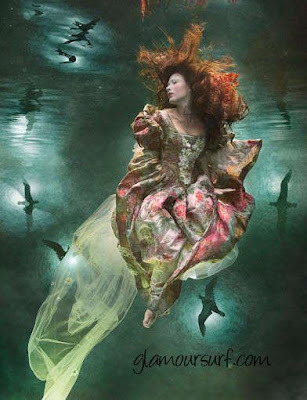 She combines the highly technical aspects of underwater photography with superb creative direction resulting in extraordinary magical imagery. She is completely self-taught in her medium. 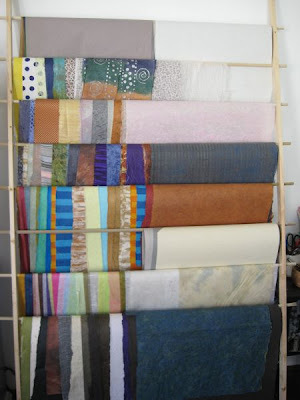 Below is a small sampling of her work, it's it amazing? Aren't these stunning images? 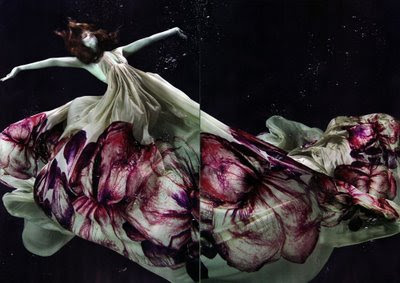 Haute couture + underwater, just the juxtaposition of that is enough to interest Glamoursplash. 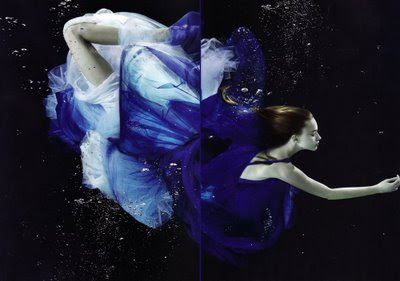 These images were shot by Parisian born photographer Alix Malka in 2008 for Japanese fashion magazine Numero Tokyo. 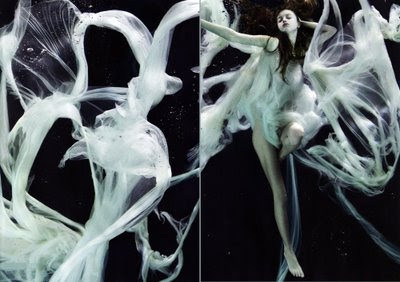 The model is Marcelina Sowa and the spread is called Sub Aquatic Beauty. The dresses are by Alexander McQueen, Lanvin, Roberto Cavalli and they're mostly made of silk. 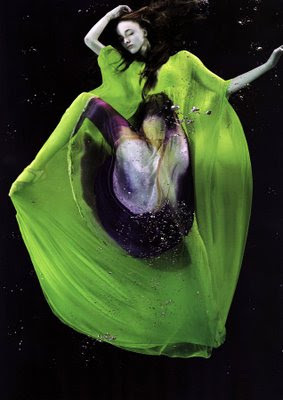 Alix graduated in 1985 and started working at the house of Thierry Mugler. After seven years he went into a short career in advertising before finally moving into photography. More of Alix Malka's work and background can be seen here. Just amazing, the color work is indeed phenomenal. Stay tuned, tomorrow we're looking at another special underwater photographer. Let us know if you have a favorite. 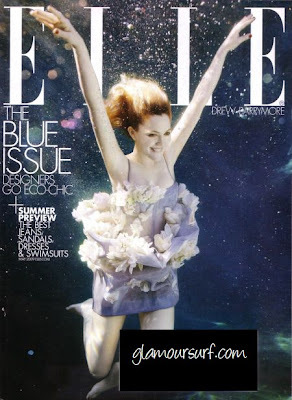 I was so excited to receive the The May 09 issue of Elle Magazine in the mail as it features Hollywood actress Drew Barrymore in a captivating cover shoot along with a wonderful article about her career. I've been enamoured by Drew and her career for quite some time and I've been longing to see the new HBO film Grey Gardens which ran recently. Unfortunately, we don't get HBO, so I am still waiting to see this film. 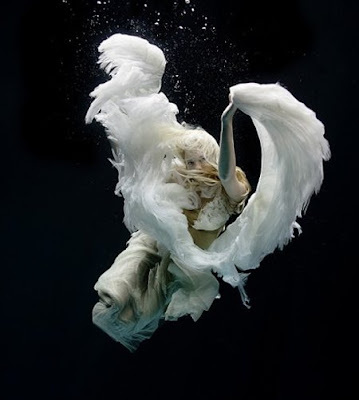 The images of Drew are shot in high fashion glamour but with a wonderful twist, all are taken underwater! Here we share with you the images from this pictorial spread. 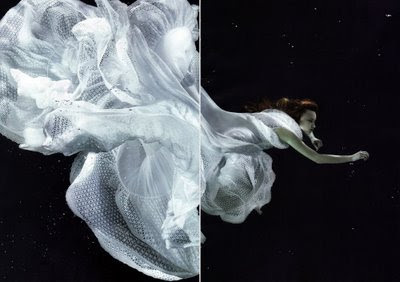 Drew Barrymore was styled by Joe Zee and captured underwater by skilled photographer Alexei Hay. So unexpected and yet so fascinating. A Slip of a Girl dishes about Vanity Fair lingerie's 90th anniversary. Couture Allure looks at shoes from 1949 and readers share where to find modern reproductions. Debutante Clothing features a review and images of the private curator led tour of the Valentina exhibit in NYC. 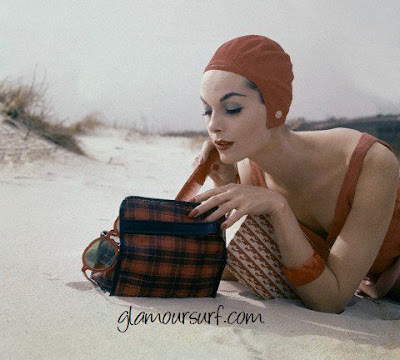 Glamoursplash gives a brief history of 1950's swim cap glamour. Here's Looking Like You, Kid says, "Maggie the cat is alive.". Swim cap advertising treatments from different companies. Some take the beauty angle, some the 'water tight' angle, and some use ingredient brand names to tempt the buyer. Let's look at a few. 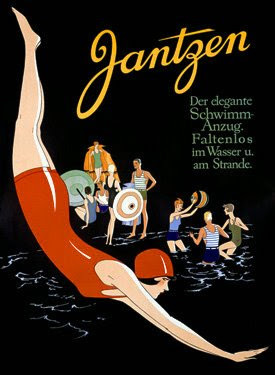 Well no, she didn't start the swim cap craze but she did get recognized as an international brand symbol. This image is from 1935. You want to be admired now don't you? 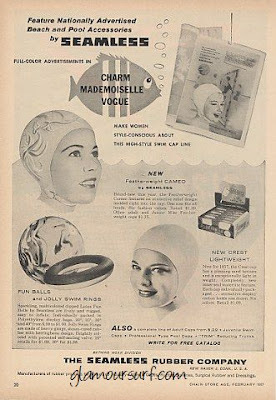 And I wonder when the term 'swim cap' became popular instead of bathing cap. 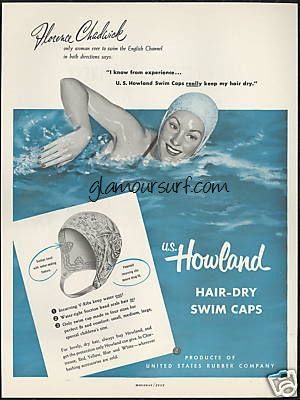 1952 Howland advertisement, but it is a bit faulty, as no swim cap that I know of will completely keep your hair dry. 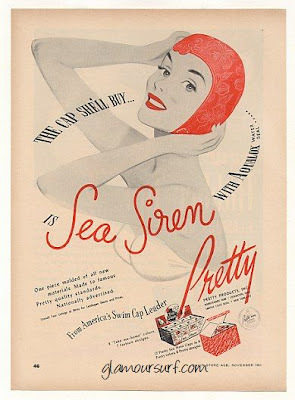 1951 Pretty Products, love the Sea Siren name for the cap but what is Aqualox??? And another from the 1940's. Note how the font changed? 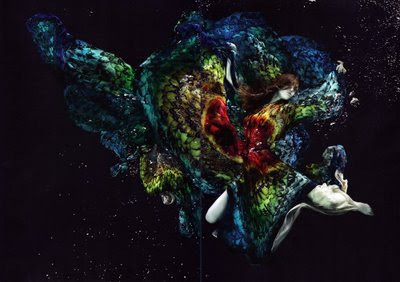 And for some eye candy, head on over to Jed Root and view some photography by Koto Bolofo for Italian Vogue. Gorgeous! Iwant the fringed blue floral swim cap! More images of swim caps used in glamour photography. This one is fashioned more like a turban, but it really completes the look of this 1950's polka dot swimsuit don't you think? 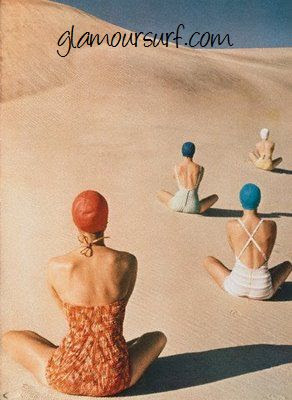 I just love this photograph, all the women are juxtaposed on a sand dune and look like sitting ducks. But the art of the alternating colors of the swim caps is what makes this shot work for me. Diver down?!? This one complete with flippers and a face mask is just too fun. And finally, two beach babes in coordinated red suits with matching swim caps. The parasol pulls it all together and makes me want to go on vacation! 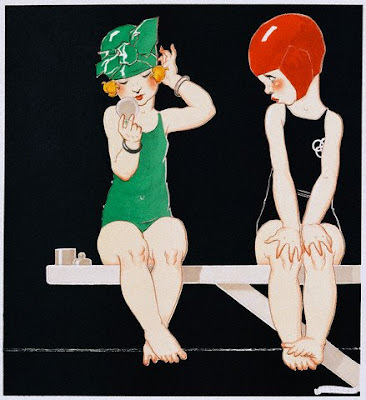 Let's start with a very brief history of the swim cap. During the early 20th century swim caps were made of rubberized fabric. By the 1920's they were being made of latex. 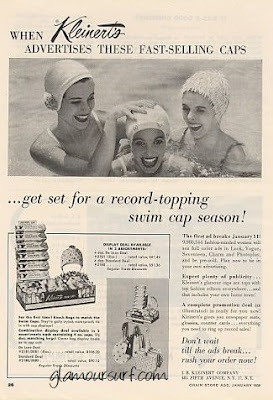 During the 1940's swim caps became scarce as rubber was needed for the war effort. 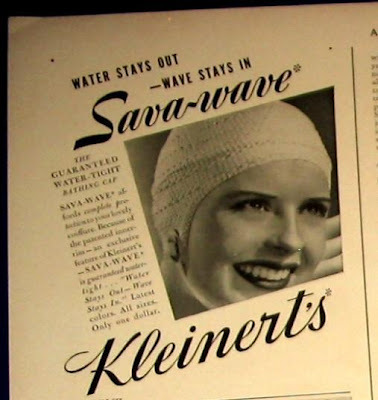 A girl was lucky if she had a swim cap to protect her wave hair style during that period. 1950's glamour is captured at the beach with women donning various colored and textured swim caps. 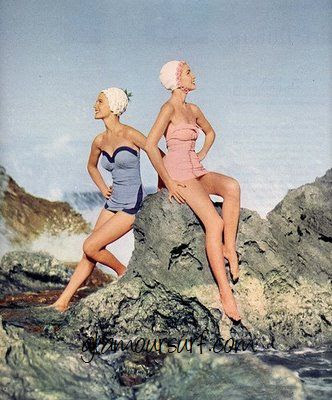 Hair was an important part of the 1950's look and no woman wanted to get her locks wet while swimming so swim caps came back into vogue. 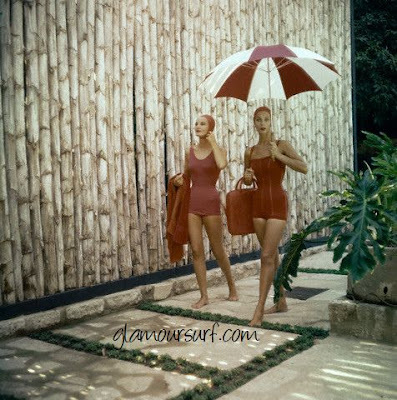 Many styles, textures and color offerings were made available in a wide assortment so one could match the swim cap to the swimsuit. By the 1960s colorful flower petal swim caps were the rage and made by such companies as Kleinerts, Platex, Jantzen and Howland to name a few. Now-a-days swim caps don't only protect your hairstyle, they protect your hair from harsh chemicals found in pools and the damaging suns rays. 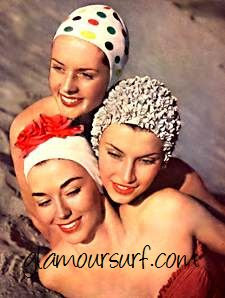 We've just listed some Fabulous vintage swim caps over at Glamoursurf. Swim on over and visit us! 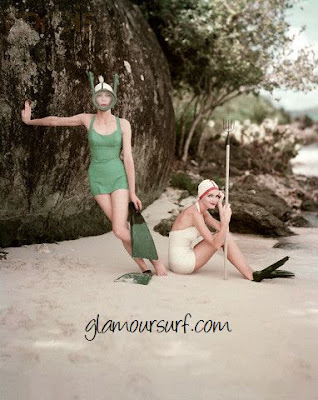 This week Glamoursplash is going to take a look at some vintage images of swim caps. We'll start with this illustration by Rene Vincent, a french artist who has a lovely style all his own. Aren't they sweet from their head to their tippy toes? Couture Allure shows how to wear summer whites with dresses from 1960 as inspiration. Debutante Clothing goes vintage shopping in her own closet. 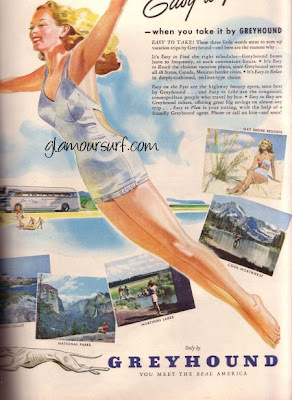 Glamoursplash looks at swimsuits used for all kinds of advertising. Here's Looking Like You, Kid gives you 40 lashes -- 1940's eyelashes, that is! Grey Gardens premiers tomorrow night Saturday April 18th at 8:00 pm. I'm so excited about seeing this film from HBO! Drew Barrymore stars as “Little Edie” Bouvier Beale. Jessica Lange stars as "Big Edie". A young Little Edie takes the runway at a fashion show, which was likely held as a fundraiser. "The Hamptons now are full of models, advertising people and celebrities," says director Sucsy, "but it wasn't like that then. They had the Ladies Village Improvement Society, which would have these kinds of charity events." The original script included a fashion-show scene in which Edie's dress gets damaged and she solves the problem by wrapping another girl's cape around herself as a skirt. Drew at the NY premier of Grey Gardens. Isn't she just beautiful in her flapper pin curls, net and red lips? Drew is wearing an Alberto Ferretti gown, isn't it smashing? She really pulls off the retro 20's look. You can read all about how Drew made extensive preparations for the film here, in fact the whole blog is devoted to Grey Gardens. 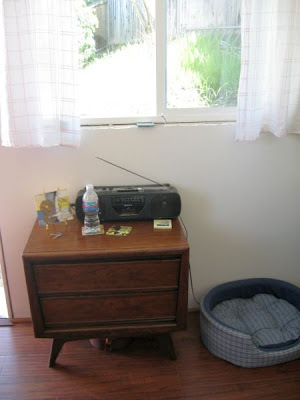 Inside Grey Gardens trailer with Drew Barrymore and Jessica Lange. You know where I'll be tomorrow night! Sharing some awesome video's with you, hope they help make you smile today! Enjoy! And for something just a bit the opposite but with a large goup of people in performance. I wanted to share a very exciting project of mine that has taken the last few months. Some of you know I'm an artist, that's what keeps me sane in this world. 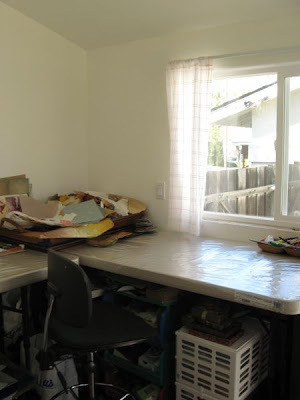 I used to have a studio in Sunnyvale, Ca. which was about 1/2 drive from my house. In October, 2008 I received notice the rent was going up and I had one artist who I shared space with leaving in December so I decided to give up my lease as of Dec 31, 2008. 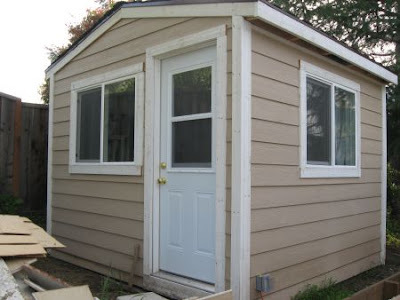 I had been talking to hubby about building me a new studio on a pad of cement we have on the side of the house. 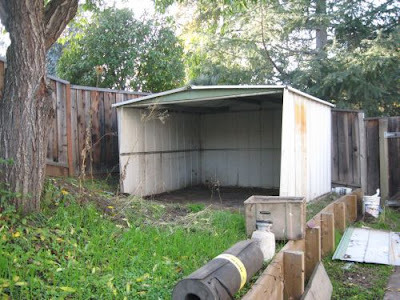 There was an old storage shed out there that had just rusted and was leaking and basically of no use. So for my combined Christmas and Anniversary gift he teamed up with our brother in law and built me a brand new 10 x 10 studio. We have just recently finished it. Hubby did the construction and I helped with the mudding of the drywalls. Then I primed and painted it, installed the electricity, installed the laminate flooring (which I got off Craigs list for cheap), hung the curtains and moved all my stuff in. I had to purge some things but all in all I'm really very excited. 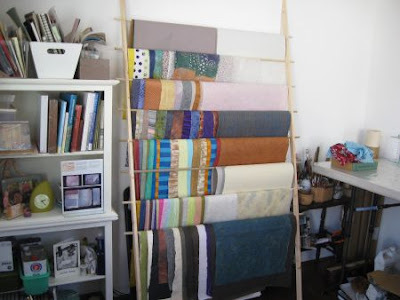 I work in paper, doing collage/paper mache/altered art; so I built this rack to hang my papers so I could store them efficiently and be able to see what I have. Here is the outcome. I can finally start creating again and let my pent up creative side loose. It still needs to have the outside painted but we'll do that when we paint the house this year. And I'll spruce it up with some plants and pavers. My sister keeps teasing me that I should have a pink tool belt and go for my contractors license. I learned a lot about construction through this process, but hubby deserves most of the recognition, I just ♥love♥ that man. Now off to get creative! 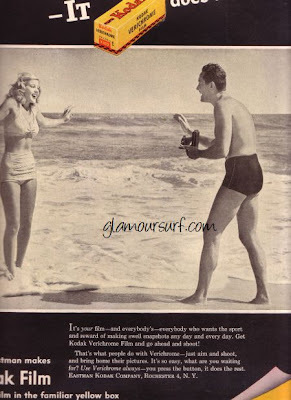 Glamoursplash shares more swimsuits images as used in advertising, this time from 1947. All of these images appeared in LIFE magazine. Marlboro Shirts Sportswear - What a man! and what a Marlboro. He's not the only one who rates an exclamation point mermaid. Kodak Film - You press the button - IT does the rest. 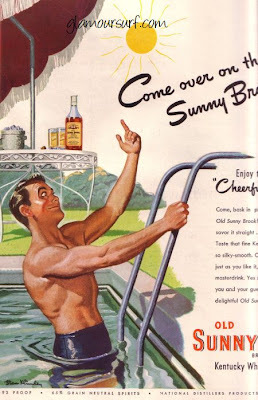 Old Sunny Brook Kentucky Whiskey - Come over on the Sunny Brook side! Enjoy the whiskey that's "Cheerful as its Name"
Greyhound - Your vacation will be Easy to Take - when you take it by Greyhound. 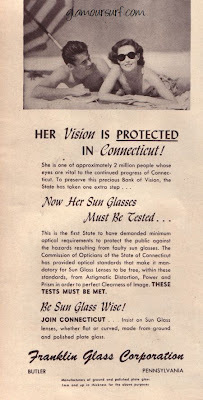 Franklin Glass Corporation - Her Vision is Protected in Connecticut. She is one of approximately 2 million people whose eyes are vital to the continued progress of Connecticut. To preserve this precious Bank of Vision, the State has taken an extra step... Now her sunglasses must be tested.